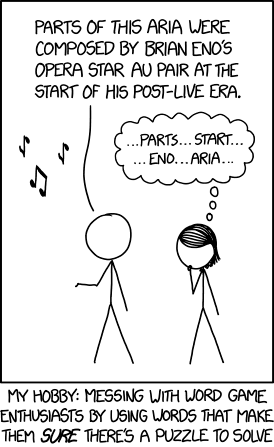 Title text: Eno's storied aria was once soloed by Judge Lance Ito on the alto oboe at Ohio's AirAsia Arena. I haven't got a friggin' clue on this one. Orro, master of wordplay, could solve it. I never got the hang of cryptic crossword clues, though my dad does them! Well I went right to Explain XKCD on this one. Nothing there yet beyond the cartoon. There may or may not be a real puzzle hidden here, but I ain't spending any time looking for it ... knowing Randall's propensity for messing with his readers' heads. I think he's just messing with the Word Game Enthusiasts, like he says, and getting a "Toblerone-Rolo combo" out of it, as well. Though whether this is intended to refer to Writer Vincent Starrett or Crossfit CEO and stand-up desk advocate Juliet Starrett, I cannot say. I don't even understand the sense of the phrase "Word Puzzle" being used here. Like, I grok that it's some sort of puzzle involving words, but I don't know what there is to be solved, what a solution would look like, how one is supposed to proceed looking for one, or anything like that. Can someone share an example of the type of word puzzle implied here and its solution? Pfhorrest wrote: I don't even understand the sense of the phrase "Word Puzzle" being used here. Like, I grok that it's some sort of puzzle involving words, but I don't know what there is to be solved, what a solution would look like, how one is supposed to proceed looking for one, or anything like that. From today's RL crossword: Vessels of the Royal Navy in America (4). "Royal Navy" is used for the letters "RN", America (in this case) is "US". RN in US would be "URNS", which are… vessels. That's an easy one. "Hunch about a piece of venison (6)" is probably "Haunch" ("Hunch" surrounds "a", the thing being then a cut of such meat) but might also be something to do with having a hunch about something, that is with six of the letters from "venison", or otherwise. I'm not yet sure, so it's only lightly pencilled in until I get some of the other clues maybe-solved to agree with it. "Having the support of the board though too old to work (2,3,5)" is a crucial one. There's often key words in a clue that often indicate an anagram of a following/preceding clue-word (mixed, tumbled, shuffle) or that a subset of some clue-words (part, cut), and the trick is to find those (if that's even what's in the clue!) and not get mixed up with the more direct clue-word ("vessels", above) that you easily might mistake for the anagram word while mistake part of the 'active DNA, junk DNA padding and enzymes' as the true target word. My Dad was taught how to do these, by a true expert. I've only learnt the principles, in turn, by casual remeniscences about the time he was in one of his first jobs and was being taught this during lunch breaks. If I pick up a paper in thr morning I'll generally do the Challenging sudoku in some time less than 10 minutes (not worth filling in the easy/medium ones), the regular crossword might take half an hour to get to the state of wondering if I should look up, the capital of some country, to break my block on another clue/confirm I've not gone wrong with it, but if I get even a half dozen of this more "word gamey" type of crossword's words then I'm happy. Last edited by Soupspoon on Mon Aug 13, 2018 7:35 pm UTC, edited 1 time in total. Fifty-fifty whether the "answer" lies in a search of the trivia of his life or the aforementioned word-hackery. ¹ Actually, poking away, it's only about half of them, now that I've poked some other places that default to https. You know what, though, this is probably better in another thread, after a bit of further checking. Now that field is an underused source of obscure crossword hints. Wiki must be annoying for you then. 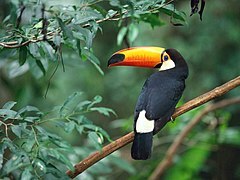 It's a toucan. Soupspoon wrote: From today's RL crossword: Vessels of the Royal Navy in America (4). I'm sorry, but that's just infuriatingly and disgustingly obtuse. (Not you, but that crossword so-called hint.) If I met such a non-clue in a crossword puzzle, I'd first, throw the book across the room, second, describe the author's questionable parentage and even more questionable intelligence at length in terms not suited for mixed company, and third, retrieve the book, find its receipt, and promptly demand a refund from whatever establishment I purchased it from. The Dutch newspaper NRC has a crossword on Saturdays, the "scryptogram," in which every single damn clue is like that. When I first started trying to solve those, it felt like a huge accomplishment to just get a single one from a whole puzzle, and that would be after hours of racking my brain. I've never solved a whole puzzle on my own. People get together to solve them as a team! People call each other on the phone to pass on the clues that they managed to crack, and to brainstorm on the ones they didn't. It's madness, pure madness! At one time I came up with the idea to get a vanity license plate with a set of six random letters that meant nothing, just to screw with the head of whatever random person was behind me at a stoplight. Reka wrote: I'm sorry, but that's just infuriatingly and disgustingly obtuse. (Not you, but that crossword so-called hint.) If I met such a non-clue in a crossword puzzle, I'd first, throw the book across the room, second, describe the author's questionable parentage and even more questionable intelligence at length in terms not suited for mixed company, and third, retrieve the book, find its receipt, and promptly demand a refund from whatever establishment I purchased it from. Read this and learn more (that I didn't even know), then! Or throw your display across the room, maybe. I'd like to know where to get started with cryptic crossword puzzles. I recently learned what they are, but if you don't recognize the format it's impossible to get anywhere. Now there is a clue for the ages. No definition part, which is OK here on the basis that the context provides an overall clue. Still working on the other one - don't tell me yet. I had been led to believe that the cryptic crossword as featured in UK broadsheets was a uniquely British thing and unknown in the US, which suggests that Randall must be thinking of a slightly different type of "word game". For anyone wanting to get started, I learned to do them during work coffee breaks. They're a nice thing to do socially, because different people tend to like different types of clue (there are four or five distinct types: anagram, build-up, "in-the-clue", "cryptic", ...). There are quite a lot of "standard" things to learn, e.g. "study"="CON", "actor"="TREE", which must be based on English as she were spoke sometime in the early 20th century and/or famous people and events of the era. Aye. And it was intended as a whole-self self-definition, in lieu, but might not have gotten past Ximenes's rules of style that I've read so much more about since composing it. Maybe there's elitism to it. Imagine you went into a topical comedy show and the guy on stage was saying something like "He who is like the second Regent of Westphalia… Does he not pour his drink into the wrong cup? "³ and the established audience starts rolling in the aisles at the astute observational comedy, but you're still trying to work out who is being said to do what. Those who 'get the joke' feel elitist, and the joke-teller who can claim to have only the elitest of audiences 'get' their jokes can consider themselves the epitome of elite that dictates who the elite are who make them so. Which obviously makes everyone else mad. ¹ More so when I (eventually) work it out myself than when it's explained to me. ² I don't claim this as a very good clue, but it's not bad for me! ³ Don't even bother looking for an answer to this one. Reminiscent of the clues on the old UK show 3.2.1. For the uninitiated, they gave out several cryptic clues to various prizes and you had to discard them one by one and hope you weren't left with the booby prize. On discarding the prize, or claiming the one at the end, the host would rip through the cryptic clue at speed, making it almost impossible to follow, and the prize would be something almost unrelated to the first read through of the clue. A wishbone brought on by Sonny Hayes came with the clue "Take one that never changes, add a pub and a precious stone, bring them all up-to-date, and now, you're on your own. ", which the contestants rejected hoping it referred to Dusty Bin. Rogers' explanation of the clue was: "'Take one that never changes', well, that could be Dusty Bin which of course is where you might throw a wishbone. 'Add a pub and a precious stone', well, that doesn't point to Dusty. 'Bring them all up-to-date, and now you're on your own.'. Well, what about the wishbone? Sonny said 'a large wishbone', so what might a large wishbone come from? Something larger than a chicken. Turkey, maybe? Now, 'one that never changes.' is a constant, a pub can also be an inn, there's a lot of precious stones but how many go with 'constant inn'? How about opal? Yes, Constantinople, up to date, the pride of Turkey, you've rejected a 3–2–1 holiday!". Wee Red Bird wrote: On discarding the prize, or claiming the one at the end, the host would rip through the cryptic clue at speed, making it almost impossible to follow, and the prize would be something almost unrelated to the first read through of the clue. The thing is, cryptic crosswords can be solved. The steps in the explanation might seem outrageous to the uninitiated, but provided the setter is following the rules, a regular solver will accept, given the solution, that the clue is valid. But rules there are: for example, an element of the clue must represent an element of the solution in the same part of speech (and, where applicable, in the same number, person or tense). I'm very cross if a setter ignores such rules. Being unrelated to the first reading of the clue is absolutely normal; indeed, it's almost a rule in itself. I'll often discard a proposed solution if it seems to fit the surface reading of the clue too well. A Mary-Sue character is a sci-fi trope where a female character inexplicably has the abilities required to overcome a series of extremely difficult and unrelated obstacles. Some people have said Rey may be a Mary-Sue character. The male equivalent is called a Marty-Sue, which some people have accused Captain Kirk of being. There is an argument over whether the Mary-Sue label is just a sexist dog whistle for people who don't like strong female characters. The reference here is presumably to Art3mis from RPO. orthogon wrote: I had been led to believe that the cryptic crossword as featured in UK broadsheets was a uniquely British thing and unknown in the US, which suggests that Randall must be thinking of a slightly different type of "word game". Well, crosswords here in the U.S. do frequently have puns. To give a simple example, I remember a clue from a New York Times puzzle last week that read something like: "Is the stopover between Belfast and Liverpool a peninsula? [15 total letters]". hamjudo wrote: Today's challenge: Create a puzzle based on today's comic. The advantage of "straight" crossword clues is that they're direct and to the point, but it's often ambiguous whether you've got the intended answer until you've got sufficient cross-checks in place, and if you don't know the answer, there's nothing you can do about it except look it up somewhere. Examples would be "Bird (6)", "Capital of Uruguay (10)". The big advantages of cryptic clues are that there are multiple lines of attack, so if you don't know one aspect, you can still solve the clue as a whole (from time to time, I've come across clues where the answer is an obscure word I don't know, but I've been able to construct the word from the rest of the clue - or sometimes you come up with a word that fits, but you can't see how it's constructed). It's also a lot more common to know you've found the correct answer to a clue. Examples "One hears a couple may give the bird (6)", "I saw a hill? Capital! (10)". It's also fairly standard (though not universal) here in the UK for multi-word answers to be broken down - "Ruby sign of engagement is fake (3,7)"- rather than just total number of letters given (in some cases, letter count is even omitted entirely). Hyphenated words are also generally indicated, though other punctuation is not. A rare type of clue that I occasionally see is the reverse clue, where the answer is the instructions, and the clue is the result of following them - an extreme example: "E (13)"
Over on the Cryptic puzzle, though, "Sounds like one who listens to the Goddess (4)" was much more satisfyingly answered (HERA), especially when the last-char-upon-last-char perpendicular cross-referenced "Part of Nassau radiates a particular atmosphere (4)" (AURA). And I'm happy with my answer to "Don't reveal the sources of leather (4)" (HIDE) even though I have no clue about the two intersections in that one. Though right now I'm still trying to justify my answer to "Rocket an astronomical distance from the Earth (6)" (¿PARSEC?) because it answers one possible definition I can extract from the clue but doesn't seem to be an answer to the rest of it. I suspect I'll instead discover "LY", "PS" or (probably) "AU" is what that bit provides, in maybe naming a rocket. rmsgrey wrote: The advantage of "straight" crossword clues is that they're direct and to the point, but it's often ambiguous whether you've got the intended answer until you've got sufficient cross-checks in place, and if you don't know the answer, there's nothing you can do about it except look it up somewhere. Examples would be "Bird (6)", "Capital of Uruguay (10)". I grew up doing concise crosswords (i.e. straight crosswords with short clues), and once I grasped the principle of cryptic clues, my best way in was to consider each "end" in turn as a concise clue and apply my normal thought processes. Over time I got better at approaching the problem from the other end. That NY Times crossword is quite a thing. The grids used for British crosswords are much sparser - it's impressive that they can even fill those dense grids, though there's clearly a greater use of abbreviations, names and foreign words. The Peninsular clue could probably be a British cryptic clue almost unmodified (it's missing a definition part, but that's often done for a themed puzzle, provided a warning is given in the instructions. ...which is GAP, so what was the problem?